It’s Valentine’s Day, a day to be grateful for the love in our lives and the impact we all can have on each other. 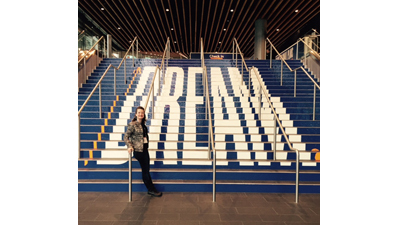 This week, I have the privilege of being at the 2016 TED Dream conference in Vancouver, BC with a lot of other people who, like me, have big dreams. I work at UCLA in kidney transplantation. I am a transplant educator – you can read more at www.exploretransplant.org, and follow me on Facebook, Twitter (@ExploreTxplant), and Instagram (explore transplant) to see what I do. There are 100,000 patients whose kidneys don’t work who are waiting for a kidney transplant on the US waiting list right now. The wait for kidneys from people who die is 5-10 years in the United States. Many patients die before a matching kidney comes available. There is a solution. People who are healthy can donate a kidney while they are alive. I have listened to hundreds of living donors tell me that donating a kidney made them understand the meaning of their own life, that they just wanted to help someone feel better, and that they are honored to do something that can give someone else a longer and better quality of life. I keep thinking, there have got to be more of these generous people out there. There are only 100,000 people who need kidneys in the US right now and there are 318 million people in the United States. It seems totally possible to solve the kidney donor shortage. Living donors are everywhere. Family members and friends of people who need kidneys donate. Women donate kidneys more than men. People in the military donate. Charitable people from all walks of life, ages, and belief systems donate. People even give kidneys to people they don’t know. Last year almost 5000 people donated a living donor kidney to someone else. But, last year, 7000 other people became too sick or died waiting for a kidney. So many people are waiting today. I think about these people often. Sometimes people tell me that I am a bleeding heart. Well, I am. I believe in the good of people and the importance of connecting and caring for each other. I also work in healthcare and believe we need to responsibly educate people who would consider donating a kidney so that they know about the process and any risks. To the best of our ability, we need to make sure that donating a kidney doesn’t harm a living donor in the future. This is my big dream. If this moves you, you can learn more about living donation at ExploreTransplant.org. And you can spread the word by sharing this article. We only need to find 100,000 people.